Sean Cudney works on the a clay moose in his basement of his Wellsville studio. 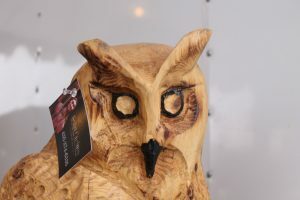 Sean Cudney, a chainsaw wielding artist, carves birds, bears, mountain lions, even people. He can look at a log and make it into whatever creative image comes to mind. Sean Cudney works on a piece during December Christmas Season. “It’s all about exposure,” he said. 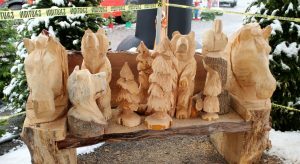 Between Thanksgiving and Christmas, the artist demonstrated his chainsaw skills sculpting a host of wildlife and trees at Merrill Family Holiday Sales. Although Cudney makes it look easy, it takes a talented and serious sculptor to produce work at the speed and accuracy he achieves. The artist carved the huge mountain man that stands as sentinel in Wellsville Park, and in California he carved a polished redwood portrait of a Native American. A couple of pieces sit on a wood bench are ready for a new home. After about 500 bears, they have become more of a pain than a challenge. Cudney not only uses wood, he also uses clay, wax, plaster or even different kinds of metal. There are a couple of successful local artists that Cudney said have influenced his style. Craig Harrison and Scott Rogers have offered to help coach him along. He’s learned a lot from them. He said the two have inspired him and given him valuable advice. 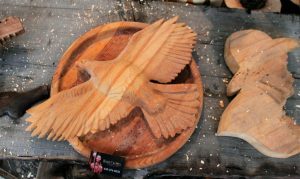 One of Sean Cudney’s wood pieces on display. He is starting to recognize he can be successful with his abilities if he works hard at it. Cudney broke his back in high school and was looking for a way to make a living other than construction. He went to a profitable hobbies workshop in Provo and began by carving an elk in a flintlock gun stock. He gradually worked his way into three dimensional pieces and different materials. 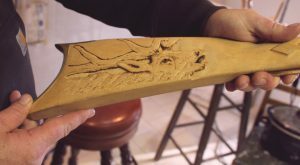 Sean Cudney shows off his first attempt at carving on a flintlock rifle stock. He’s been in construction 25 years and owned a tree trimming company. Sixty percent of his time was cutting trees and 40 percent was construction. 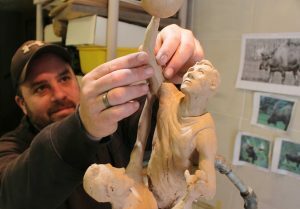 Sean Cudney works on a basketball sculpture as a chance to do work on a human form. He thinks he knows what he needs to do to make his art pay. It’s just getting there. He said he has a large piece of wood which he plans to use for carving a large sculpture for the American West Heritage Center. He is working with a committee to get a grant. He is working on a moose using clay, an action basketball figure of two players, and a draft horse piece. “The human form is really difficult to do,” he said. “Then when you add action, it becomes more difficult.” He said he had a lot of pictures to work with and that helps. 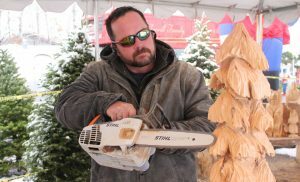 Cudney cut several pieces during his time between Thanksgiving and Christmas at Merrill Family Holiday Sales. There is a small community of sculptors in the valley that really do some nice work.